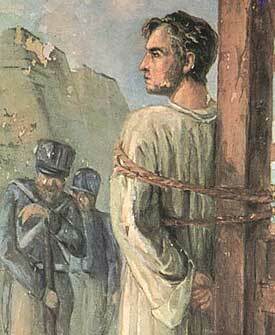 On this date in 1825, Portuguese divine Joaquim do Amor Divino Rabelo e Caneca — more popularly and succinctly known as “Frei Caneca” — was executed along with seven others in Recife, Brazil for a short-lived revolt against the newly independent state. This revolt unfolded against the backdrop of Brazil’s successful war of independence against Portugal. You’re heard “meet the new boss, same as the old boss”? It was literally true in this case. The heir to the Portuguese crown,* Pedro I, made the unusual career choice of declaring Brazil’s independence from his own dad, costing the House of Braganza a good deal more than is usual for family therapy. And of course one so often grows up into a belated appreciation of one’s parents’ formerly objectionable characteristics. For Pedro’s new South American polity, there ensued the age-old conflict between federalism and centralization: having promised the one when in need of popular support for his revolution, Pedro delivered the other when securely lodged on the Brazilian throne. Liberal Carmelite intellectual Frei Caneca — “Father Mug”; here‘s his Portuguese Wikipedia page — had done four years in the clink for his support of that earlier revolt, but he did not hesitate to throw in with Manuel de Carvalho (Portuguese again) when the latter proclaimed independence from Brazil. Pedro I, Emperor of Brazil, found this sort of behavior much less appealing done to him than by him. What are the demands of the insults from Pernambuco? Certainly a punishment, and such a punishment that it will serve as an example for the future. The story goes that Frei Caneca was doomed to hanging — the fate suffered by his fellow-martyrs this day — but so beloved was he that nary a Pernambucano could be found willing to stretch the friar’s neck. It’s a nice 19th century liberal-man-of-the-cloth twist on that ancient hagiographic trope, the “holy man (or woman) who defeats the execution device”. Unfortunately for Father Mug, that’s usually only a one-device-per-execution deal. In this case, Brazil did locate personnel willing enough for a firing squad’s worth of guys to shoot Caneca dead. This lyrical end was set to verse in “Auto do Frade” by Brazilian poet João Cabral de Melo Neto. * Pedro would inherit the Portuguese throne in 1826 on his father’s death, briefly and theoretically uniting the realms, but power players in the motherland gave him the boot within weeks. ** The flag of the 1817 Pernambucan Revolution is Pernambuca’s state flag today.